The UBC H35G-3/8 Tayfun Horizontal 75 Ft. Glycol Chiller with a totton pump is an excellent glycol cooler. 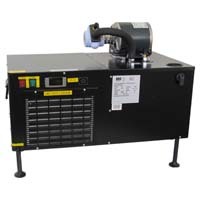 Glycol power pack comes equipped with a 1/3hp compressor and digital thermostat. This tayfun chiller includes a 5GI bath and has up to a 75' run distance. A glycol chiller is the right solution if you're using a long-draw system - meaning you would like to have your chiller several feet away from where you plan to dispense. This system implements the power of glycol to move beer further distances, while still keeping it cold from keg to tap. Propylene glycol is combined with water to create a chilled mixture that's pumped from the glycol power pack through the cooling lines that run parallel to your beer lines. Propylene glycol, a non-toxic, food-grade antifreeze, is the main component that's been used for many years in food-processing systems. Glycol cooled draft beer dispensing systems are typically used in commercial applications such as bars, restaurants, and stadiums. Comments: I'm using this to control temperature on a 25 gallon stainless conical fermenter. It has more than enough capacity for my needs. It gives me room to expand. The unit is quality built. Easy to set up performs very well. I am very happy with this purchase.